A graphic social media flowchart helps users to get started any new social media quickly. As the popularization of mobile phones, social media is becoming an integral part of online life. More and more social websites and applications proliferate. Following are some guidelines to create a professional social media flowchart. Social media is the collection of online communications channels which enable people around the world to interact with each other by sharing and consuming information, ideas, career interests and other forms of expression. They change the way individuals and large organizations communicate. There are many types of social media, such as blogs, business networks, enterprise social networks, forums, microblogs, photo sharing, products/services review, etc. And Facebook, Twitter, Google+, Wikipedia, Linkedin, Reddit, Pinterest are prominent examples among the different types of social media. 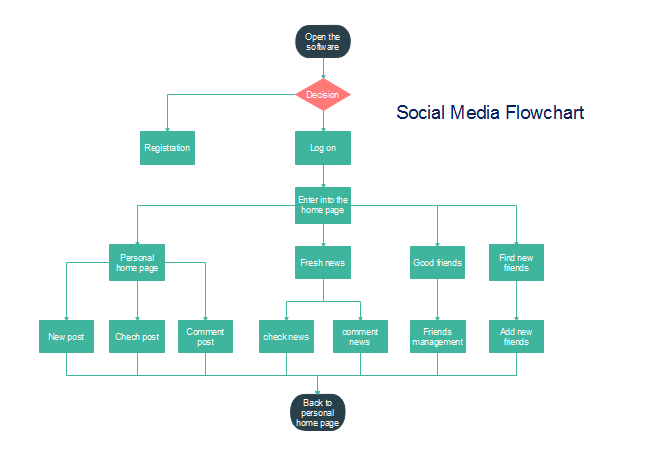 Social Media Flowchart is a diagram flow which depicts the detailed steps to use a social medium. Users will find those new social media easy to use if there is a vivid flowchart with specific steps description. Creating a social media with a smart flowchart creator, Flowchart Maker, can save us a lot of time and energy. Just follow the below steps and you will find drawing a flowchart is much easier than you have thought. Determine which social media flowchart to create. Think in mind how to process the flowchart. Drag and drop flowchart symbols on the page. Text each step into right symbols. Connect the symbols with arrow in order. Complete and improve the social media flowchart. After finishing those 6 steps, a professional and attractive social media flowchart comes out. And below is an example for your reference. Flowchart Maker is an user-friendly flowchart creator, which makes it get more and more popular. Following are reasons why do people choose it. 1.Similar user interface with Microsoft Office and fully compatible with it, convenient for file formats conversion. 2.Thousands of flowchart symbols to drag-and-drop and customizable templates for making changes to fit different need. 3.Requiring no drawing skill and you can create your professional flowcharts with minimal effort and time. 4.Smart connecting can help users maintain flow and relationship easily. Except for basic flowcharts, Flowchart Maker also has many other types of flowcharts, including BPMN flowcharts, cross-functional horizontal and vertical flowcharts, data and event flow diagram, IDEF and SDL diagrams, etc. Just click flowchart types to view different and download flowchart templates if any interest.